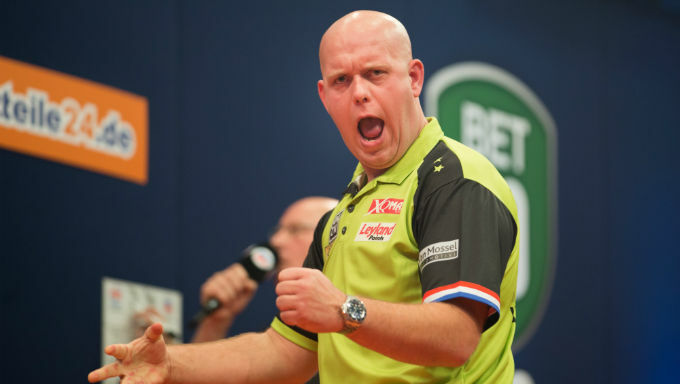 The Players Championship Darts gets underway on Friday and plenty will be backing Michael van Gerwen to win the tournament. But there is cause for concern among those betting on darts right now that the Dutchman is faltering. The World Championships are just around the corner and the Players Championship Darts is usually a good sign of where the top stars are at heading towards Christmas. But MVG is not the form man at present, and that could have darts betting fans worried. Bookmakers William Hill have van Gerwen as short as 11/10 to win the Players Championship Darts. But there are far better odds out there for shrewd punters. Michael van Gerwen does have an aura about him when on the oche. The Dutchman is rightly seen as the best arrows man on the planet right now. He’s enjoyed a trophy-laden summer and last month won the European Darts Trophy and the World Grand Prix. But there are issues for MVG heading into the Players Championship Darts. A last-16 exit to Steve West at the European Championship was concerning. But MVG then crashed at the World Series of Darts quarters, before being beaten 16-12 by Gary Anderson in the Grand Slam of Darts semis. All this within a four-week period. Van Gerwen is still going deep in tournaments but most darts betting fans back him to win titles. Yet on this form he is not worth the prices currently available. There are better odds out there to chase. Gary Anderson beat MVG in the semi-finals of last week’s Grand Slam of Darts. And if the Scot is ever going to realistically challenge for the Worlds this winter then he needs a title under his belt. Anderson lost last week’s final 16-13 to Gerwyn Price. But his average across the tournament was solid. Anderson’s last title was at the Champions League of Darts in September, where he was playing best-of-19-leg matches against the top players in the world. Group phases suit Anderson but the Players Championship Darts is a straight knockout tournament. Can he get through the early rounds? Form says yes and he is the second favourite at 4/1 to win the title with Bet Hard. Like MVG, those odds are slim in a field of 64 players. Darts betting fans may therefore want to look elsewhere. Gerwyn Price won the Grand Slam of Darts last week and is in the form of his career. The Ice Man also won the International Darts Open in September and reached the World Series of Darts semis earlier this month. Price’s averages have never really been the best but he grows into tournaments and enjoys a close victory. Betfair have Price as a nice 33/1 outsider to win the title here. There are six rounds at the Players Championship Darts this week, all crammed into three days. And the disparity of talent between the top and bottom players is large enough to bank on an accumulator. The PDC’s top boys should have no problem getting through that first round. A quick browse of the first-round matches and clear winners start to jump out. Van Gerwen should beat Matthew Edgar, a player MVG has not faced since losing 6-5 to at a UK Open qualifier in 2011. Van Gerwen is a different beast now and is 1/20 to win. Rob Cross should equally have little worry against 56th-seed Cristo Reyes, who largely plays on the European Tour. Englishman Ian White is a surprise top seed at the Players Championship Darts, but that’s because the tournament is seeded on prize money earned during Players Championship events throughout the season. White won two tournaments this year and reached two further finals. He won’t win this title but is 1/4 to edge first-round opponent Scott Taylor. Title-hopeful Anderson is 1/10 to bypass Alan Tabern. And to round off your acca, consider World Series of Darts finalist Michael Smith a tasty bet at 1/4 (Bet365) to beat Vincent van der Voort. £10 on a five-fold accumulator brings back £24.54 with 888Sport. Not a bad start to a Friday night.